4) 21st century literacy -- the clash between old and new technologies. Representative of SISTERS Magazine (The Magazine for Fabulous Muslim Women). The event also features a large book fare and exhibition with a diverse collection of books and multimedia for children and adults. Children's Behavioural Problems - Why Is It So Common? The conditions surrounding modern childhood affects every child, every family and every parent. However many parents and adults interested in the welfare of the children do not realise this until at a later stage of the development of the child when it may be too late to do much about it. There is widespread lack of awareness of what is good and what is bad for the healthy development of a child. Instead of helping the child grow up bright, balanced and confident to reach their full potential, parents, teachers and other adults inhibit their healthy growth (by means they think are in the interest of the child) resulting in childhood depression and other behavioural problems. This dilemma is faced by both Muslim and Non-Muslim families alike. Raising bright, balanced and confident boys and girls in the 21st century is a real challenge. The first step towards overcoming this challenge is to gain awareness of the modern conditions that affect childhood development and then to know what we can do about it. Many academics and professionals have had this knowledge for quite sometime but it is about time that every family, every parent and every teacher get to know this because it is only they who could bring about a positive change. 21st Century Children - Raising Boys & Girls in The Modern World Seminar by Sue Palmer is meant to educate the public what some professionals and academics have known for years. This is an essential seminar for all parents, teachers and anyone interested in the welfare of young people. This is a priceless seminar for the future of our children. Please book your place now at http://www.21stcenturychildren.org.uk/p/registration.html. Welcome to the 21st Century Children Seminar website. 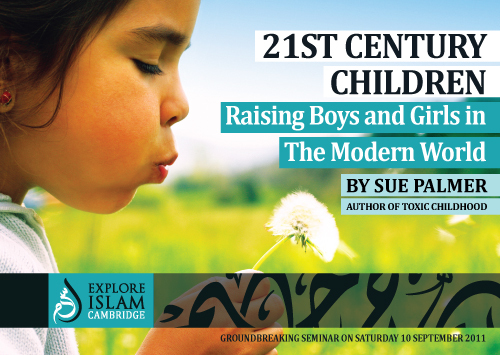 This invaluable seminar coming up on Saturday 10th of September 2011 in Cambridge is conducted by Sue Palmer - the author of the revolutionary book Toxic Childhood - How modern life is damaging our children and what we can do about it. © Copyright Muslim Education & Outreach Cambridge 2010, 2011. Powered by Blogger.